As usual life piles up on us and before you know it a trip you have planned sneaks up on you; suddenly it’s time to leave. This was the case with my long awaited fly fishing trip for steelhead in Northern California. Mike McGuire and I left South San Francisco early one November morning headed north. Soon we were heading across that Golden Bridge that guards the entrance to the San Francisco Bay. We took a break in Humboldt County to fuel up both the truck and ourselves. I never realized that there are locals up there that dress up like Rastafarians, hair and all? Soon we were at the well stocked Eureka Fly Shop and stopped in for something extra we might need. A friendly fellow runs the shop and he is a good source of information; he carries a ton of goodies one might need to fish the coastal and nearby rivers. Soon we had our stuff in a cabin at the Marble Mountain Ranch; we put on our waders and we were headed off to the great Klamath River in search of Steelhead. We stopped at a river access point, set up our rods and started to swing flies. It was late afternoon and the sun was already casting long shadows when I felt a nibble. I cast again and after a swing of the fly I felt a good bump; I set the hook. The next thing I knew I had a fish on! I yelled down the river to Mike “FISH ON! !” The half pounder, as the smaller steelhead are called, started taking out line and fought like a champ. The 7 weight rod had a good bend in it most of the time and he made 3 or 4 jumps. The colors he displayed while fighting his fight were a bright flash of chrome highlighted by a dark top. He looked like a small salmon. I got him close to shore but he was squirmy and hard to hold on too. It was hard to hold him still for a picture. 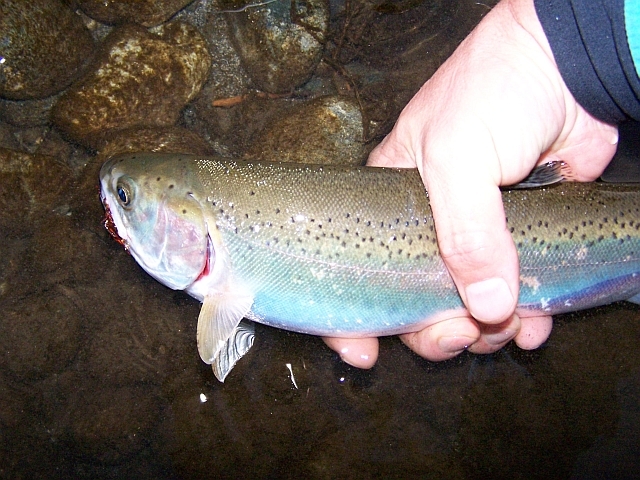 Once I got to see his side’s the rainbow trout colors came through; he was about 20 inches long with big shoulders. 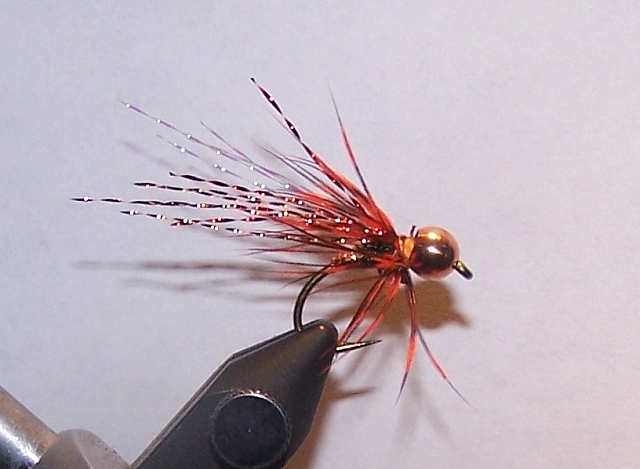 I had landed my first steelhead on a fly rod I built and a Copper Herniator Fly I tied a couple of days earlier. The next day all we got were a few bites and bumps; we moved to many new places on the river. You can drive for miles and never fish the Klamath River in the same spot. They say steelhead are the fish of a thousand casts and I had quite a few casts left before I hit that magic number. The next day we had a float trip planned with Doug from Marble Mountain Ranch, where we were staying. I forgot to mention we had excellent meals there every evening. We ate to our fill and drank to our satisfaction. The cabins were immaculate, everything worked. It is an amazing place this marble Mountain Ranch; a true jewel encrusted in the Marble Mountains near Somes Bar, California.http://www.marblemountainranch.com/ . At dinner we planned the next day’s float trip with Doug. The forecast called for rain and although there was little possibility of the river being blown out we wanted to make sure we would take the best possible route. Who can sleep the night before a float trip? Not I, soon it was first light, pouring rain and we were floating down the Klamath River. What an amazing un-spoiled place miles and miles of green trees and pristine river. Soon we were into fish, lots of fish. They were mostly half pounders up to 20 inches or so. I caught a few smolts and was soon deemed king of the smolts. Mike was fishing with his hand crafted bamboo rod and tied into a nice adult steelhead. It fought hard and jumped numerous times. When these fish jump they don’t just leap like a trout they move tremendous amounts of water and leave a wake. Since we were using barbless hooks, the whole time the fish is on you hope it doesn’t get un-hooked. Mike’s adult steelhead came close to the boat 3 times but unfortunately it could not be landed and somehow it got un-hooked. This was a disappointment for all of us but we had plenty of time left to catch more. We caught some more half pounders, switched flies and continued to fish. 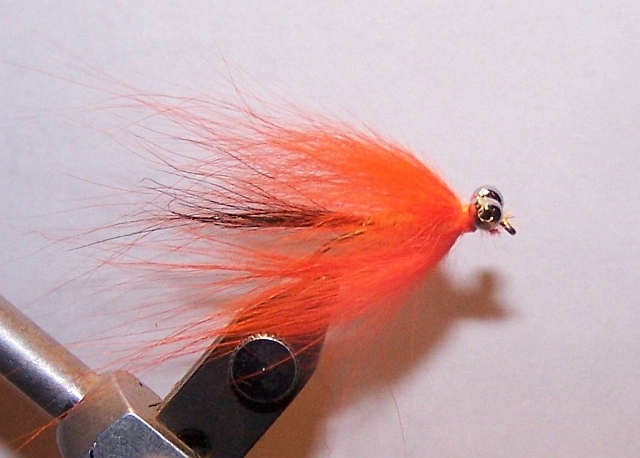 I was now using a fly called a fiery comet and we were fishing close to some salmon reds. Then BAM! I had my first adult steelhead on. He didn’t feel extremely strong at first but you could certainly feel his weight. Then he hit hard and started a fierce run, straight out at first and with the current; my reel singing zeeee, zeeee, …. Then he switched directions and was heading for the willows to try and break me off. Doug shouted “Rocky turn the fish away from the willows!” all this was happening in what seemed like slow motion. I was able to turn him and continue the fight. I barely made any progress for what seemed like hours. He would take out line and when he was done I would real in. The fight was on! Back and forth we went finally he tired a bit but just a bit. He came towards the boat and I reeled in but then he decided to dive down next to the boat and try and break me off that way. Again Doug gave me some direction “Rocky move him back, let me net him” But the steelhead got his wind back and off for another run he went. I managed to get him close again after what seemed like an eternity; Doug then was able to net him this time. This fish was full of piss and vinegar. Mike held on to him in the net in the water while Doug got all the photo equipment ready. He was energetic and Doug held on to him while Mike took some photos. I briefly got to touch the steelhead that had battled me so valiantly. Once he was placed in the water for revival it was no more than a nano second before he splashed us all with water and surged off into the Klamath never to be seen by us again. We fished until it was too dark to see; catching half pounders along the way. Mike and I quickly packed up and headed to the main lodge for our last dinner up here; as usual a fantastic five star hot meal, good conversation and wine. Soon we said our farewells and we were ready to go on our next fly fishing adventure.